Suitable for Carrycots and Group 0+ Infant car seats, All-in-One. Uniquely designed Universal Group 0 raincover: suitable for most carrycots and infant car seats and specially designed to complement the Jane range of carrycots and car seats, so there is no need to buy 2 different raincovers. It’s reinforced to prolong life of the accessory. Universal fitting - fits most Carrycot/Prams and Infant Car Seats on the market. A necessary addition to my Jané trider. Hi Can you confirm that this universal rain cover will fit my Jane Matrix Light 2 car seat in both lay flat and upright mode? And also fit the Koos Car Seat and Micro carry cot? Thanks. 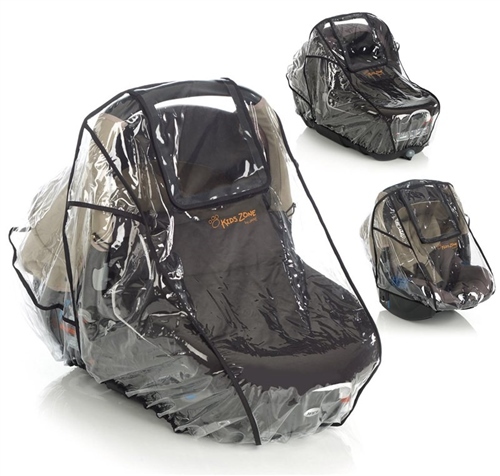 Jane UK Replies: Hi Rosella, yes this raincover is designed to fit both carrycot and car seats. Its universal and so fits many. Although it's probably never going to be as good as the tailored raincovers made for the each individual carrycot or car seat, it does save you a lot of money and also the convenience of one fits all. Hope this helps.